Renault is one of several manufacturers that likes to lay claim to the fact that it created the MPV. Chrysler makes a big case for itself with the Minivan from that there America, but when it comes to Europe, Renault say it was the creator of the MPV with the Espace that first arrived here in 1985. Back then it was a revolutionary design. Indeed, the original Espace still looks intriguing today and has become something of an under the radar cult classic. Over the years - and as the MPV market become ever more saturated - the Espace got somewhat lost among the noise of people carriers, but it remained true to the original idea of an innovative yet practical people mover with a unique design. Fast forward to 2015 and while Renault still makes the Espace, it's sadly no longer sold in the UK. In early 2012 Renault 'streamlined' what it offered in the UK, which meant slow sellers like the Wind, Laguna and the Espace, were all ditched. This was part of its plan to focus on smaller cars like the Twingo as well as the arrival of its budget brand, Dacia. To be fair, we doubt many people noticed, let alone were sad to see it disappear off the price list. After all, SUVs and crossovers were the future right? Well perhaps not because big MPVs are still hugely popular with family buyers. You only have to look at the number of Ford S-MAX and Citroen Grand C4 Picasso models you see at the supermarket car park. So perhaps the Renault Espace is due for a comeback? After all there is a new Espace that's sold in the rest of Europe and actually looks quite good. We could quite easily see it as a rival for the likes of the Volkswagen Sharan. Until then if you want an Espace you'll have to look at the last version. But the good news is that it is still a very good large people carrier. And good value as a used buy. We had a quick look through the classifieds and while there aren't a huge number of Espace and Grand Espace models, there's a decent number of well cared for and low mileage examples about. Like this 2006 Grand Espace in top-of-the-range Initiale trim on at £4990 with just 62,000 miles. It looks smart in its silver paintwork and comes complete with a cream leather interior. Now that wouldn't be our choice for a family car - and indeed the driver's seat would certainly benefit from a professional clean - but the rest of it, including the boot, looks remarkably clean and tidy. This Espace also has satellite navigation (don't expect that to be very good or very up to date though), cruise control, electric seats, xenon headlights and usefully for such a big car, front and rear parking sensors. It's powered by the big 3.0 dCi engine too with a six-speed auto box. With 180PS, the big V6 diesel has plenty of get up and go along with a nice meaty sound. So while the 2.0 dCi may be more economical, we think the 3.0-litre is a far nicer drive, especially on the motorway. The big downside is annual road tax of £490. Ouch. Plus don't expect great real world economy with a claimed 29.7mpg. And what about reliability? Renault hardly has the best reputation on that front. Indeed, the Espace was the least reliable 3-5 year old family car in a 2012 analysis of Warranty Direct Claims records. So if you're looking at a used example, buy carefully. There are several things to be wary of. The funky digital dash looks great but is prone to fail and can cost a hefty £800 to repair. Problems with the automatic gearbox are also common because the transmission fluid cooler is situated in the radiator and if it fractures, engine coolant gets into the transmission. Elsewhere, a loss of power and cutting out may eventually be traced to the brake light switch sending the wrong messages to the ECU. You do have to tread carefully, but that's the case with any used car at this age. 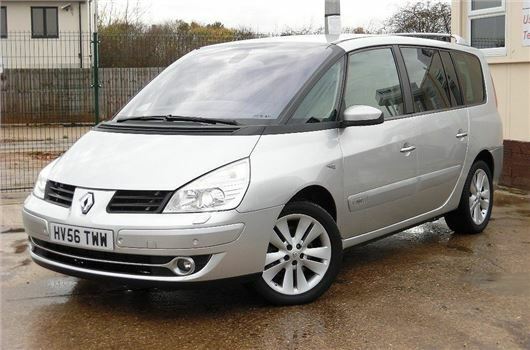 And if you buy a good one, you'll be getting a hell of a lot of Espace people carrier for less than £5000. It still looks good and is one of the most spacious and practical MPVs around. Even if Renault no longer sells it in the UK.